Halton Regional Police Services Board has generously donated $2,345.00 from the Board Trust Fund to Crime Stoppers of Halton in recognition of the important work the organization does for the community. 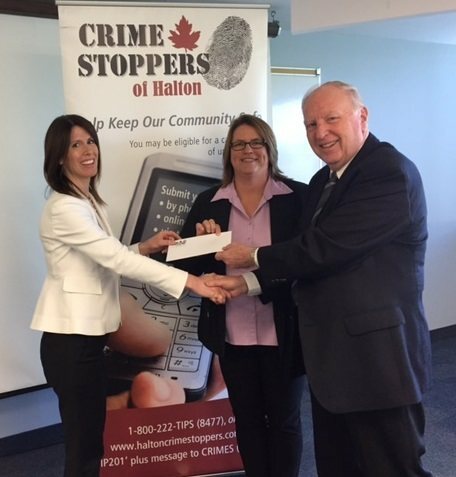 On Thursday, June 1st, 2017, at Halton Regional Police Head Quarters in Oakville, Ontario, Julie Moscato, Executive Director of Halton Regional Police Services Board presented Cal Millar, Chair of Crime Stoppers of Halton, a cheque for $2,345.00 alongside Crime Stoppers of Halton Police Coordinator, Detective Constable Jodi Richmond. Crime Stoppers of Halton is an independent, non-profit, charitable organization that relies upon the financial support of community partners, citizens and corporate sponsors. Together they work to help keep Halton Region as one of the safest communities in Canada, allowing people living in Burlington, Oakville, Milton, Georgetown and Acton to continue to enjoy a high quality of life and sense of security. Crime Stoppers of Halton is extremely grateful for the ongoing support of the Halton Regional Police Services Board.